Do you have any childhood food memories? Do certain foods, cooking smells and rituals take you right back to a less stressful time when things seemed a whole lot simpler? I have a ton of food memories, but one in particular that stands out for me is my Gran’s savoury pancakes. I really loved them. They were thick, fluffy and extremely good alongside sausages, bacon and baked beans. That’s how I remember eating them. They always contained sweetcorn and if we hadn’t used it all up in sandwiches and toasties, cheddar cheese. My Gran was very much a use-up what-you’ve-got cook. These sweetcorn and feta cheese pancakes only vaguely resemble the ones from my childhood. If my Gran was still here, she would probably say they are “a bit fancy.” She definitely wouldn’t drown them in chilli sauce like I do, but it’s my weakness. I love chilli the way I used to love chocolate when I was a teenager! 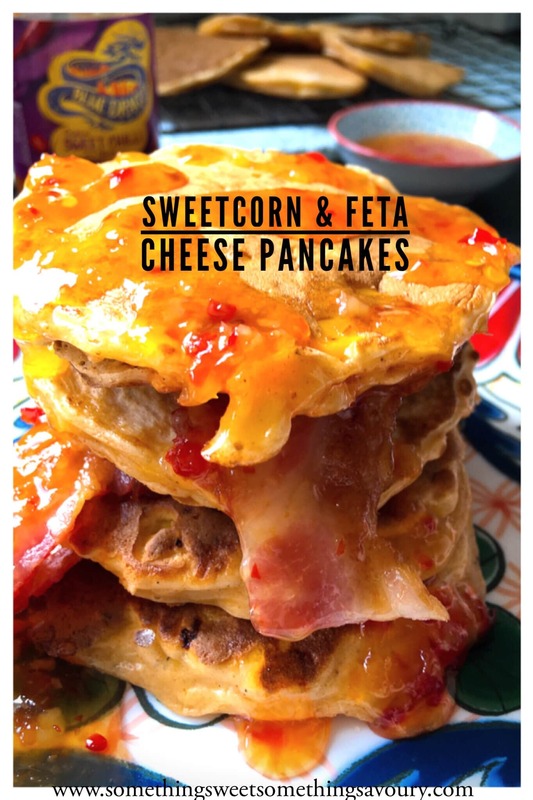 I’ve used feta in these pancakes, but they are also really good with cheddar. I use tinned sweetcorn unapologetically, but when fresh corn comes into season, I’ll absolutely be using it instead. These pancakes are also very good with sausages or roasted tomatoes, avocado, beans etc – the usual breakfast fare! In a large bowl, combine the flour, baking powder, paprika and a good grinding of salt and pepper. Crack in the eggs and pour in 100ml milk. Mix well using a whisk until you have a smooth, batter. It should be quite thick, but not stiff. Add a little more milk if needed. Stir in the sweetcorn, spring onions and feta. Heat one tablespoon vegetable oil in a non stick pan. Drop spoonfuls of the batter into the pan, cooking for a couple of minutes until the underside is golden brown, then turn them over and continue to cook for 3-4 minutes until golden. Place the pancakes in a warm oven while you make your accompaniments. 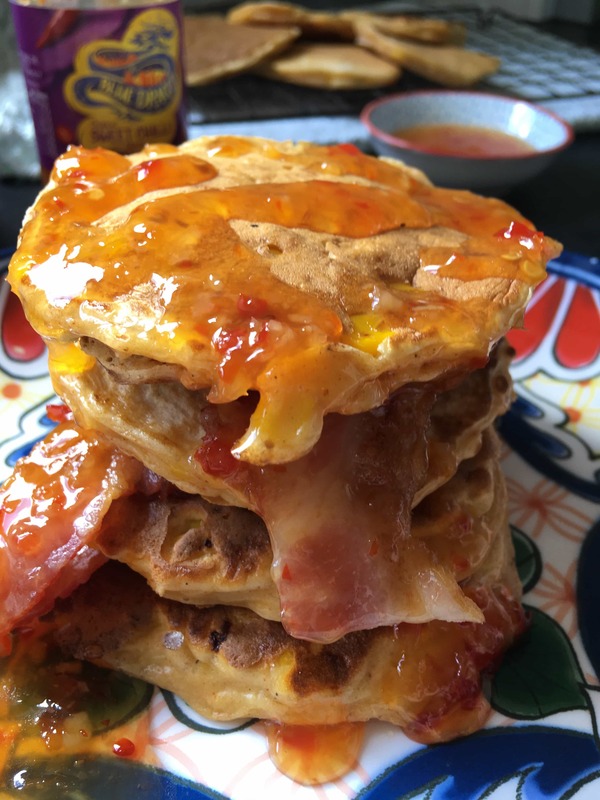 I love them with streaky bacon and of course, lots of sweet chilli sauce! I’m also linking up over at Easy Peasy Foodie for #CookBlogShare. P.S. And thank you for sharing it with #CookBlogShare! You’re very welcome, thank you for hosting! ? Thank you! They would be fab with maple syrup ?